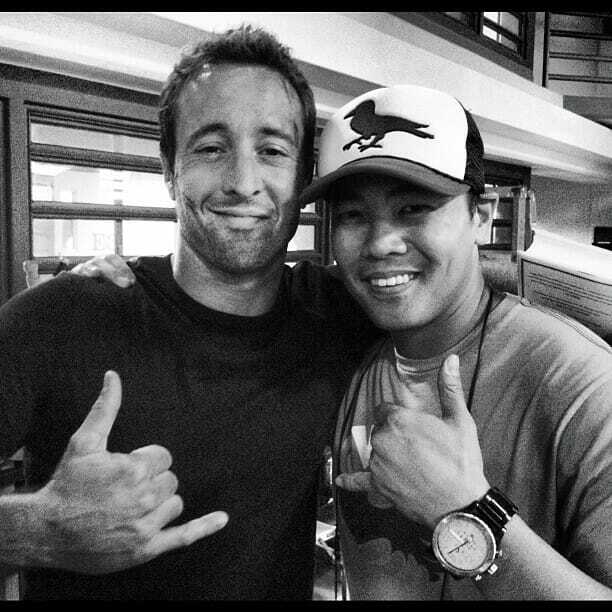 A photo taken on the set of H50 episode 2.22 as it wrapped up. Tweeted by director/Producer Larry Teng. Alex looks really tired but it may have been a grueling day on set. That’s a wrap on Ep 2.22 of #H50… Might overtake 2.15 as my most fave episode that I’ve done with this awesome crew. Epic is the word. :heart: My darling Alex…you are such a special man. Lord how I wish he could read these words. So proud of you the way you came through your recent “troubles”…health and happiness to you and a good rest before they put you through your paces again. Lord, I hope they don[‘t overdo the physicality of your part and have you hurt again but your part in that drama is so physical I don’t see how they could tone it down. Hopefully, the powers that be will have some good sense. Buring you out is NOT what we want to see. ^_^ You are so versitile it shouldn’t be necessary to put you through meat grinder every week. The body is only so strong and you aren’t 25 anymore! Love love, and can’t wait to see you next season..Love and prayers :love: Suzanne your Forever fan remember fans, let CBS, TV Guide and of those publications now we love our Alex and treat him write…. Several of us here cant access to the Alex O Loughlin Rocks, to post comments, to see the page without registering as a member you can see the site but if u want to register as a member and post comments, you cant, something about the page that do not accept the username does not allow to post comments. I do not know how other fans can do it and not others. thanks for the pic tiff, alex looking good, bit tired but looking good! lovin season two. we have just had the valentines day episode…….. gorgeous in his suit i must say. all the best to you alex. Tiffany, thank you for the recent photo of Alex. I’m very happy he’s back! Devon Nekoba was being interviewed. He played TSA Myers in the recent episode with Steve’s sister. â€œI was practically running after Alex (in the scene) because he walks so fast.â€ “Oâ€™Loughlin and Caan had a nice rapport together and Caanâ€™s dog, Dot, was always with him.â€ When he encountered Alex for the first time, he saw Alex waiting by a van and thought, â€œIâ€™m going to ride with Alex?â€ Oâ€™Loughlin put out his hand and said, â€œHi, Iâ€™m Alex.â€ â€œI kept my cool, and said â€˜Hi, Iâ€™m Devon,â€™ but I was thinking â€˜Um, DOH, of course you are Alex.â€ Once in the van, Alex asked him, â€œHey, do you want to run lines?â€ and so they spent the ride preparing for their scene together. This, for those that don’t get Alex, is why we admire him so much. So down to earth and sensitive enough to know when someone might feel a little intimated on his first day to the set. It’s nice to see he hasn’t changed with fame. Shirley I have read the article about that local actor and his first encounter with Alex. For sure it seems Alex is a very humble, down to earth, accesible guy and very helpful. Not many actors are like this, because nowdays many actors and actresses are so stuck up and arrogant tthat they believe they are God or a Goddess and people have to yield to their demands and stuff, like they are untouchable. Alex seems so different from many of those actors and actresses, even if he is an actor and are involved in the entertainment business. I will like to mention here some of the words Alex had told to magazine interviews during the course of many years, regarding fame, pouplarity and beign famous in the industry. Those are just fo a few words that Alex has said and what he thinks of fame and popularity. Oh so glad to see that gorgeous smile….and if he can smile thru the fatigue all well and good. i’m with you all, looking forward to the upcoming episodes …with STEVE. OMG Can Alex EVER look bad???? Because I have NEVER EVER EVER seen a bad picture of this hunky guy!!! Tiff as I know u are very resourceful. I hope you can find and post them here some new pictures on the internet a friend just sent me of new photos of the infamous Ep. 2.22 where Steve and Wo fat are together and cuffed to each other. Cant wait for that episode for sure but I believe as I read somewhere I dont know if it strue or not, the Wo fat character will be on episode 2.22 but not in the last episode of the season. Does anyone know anything? Great to see Alex looking much more healthier,a nd back enjoying his work. So good to have visual affirmation that Alex is recovering from this ordeal. Many thanks Tiffany for always keeping us up to date. Thanks Tiff for this gorgeous picture of Alex 😀 . He sure look tired but my guess is for sure that after filming a very intense episode, who wont be that tired after running outdoors, and doing some heavy duty scenes and being very acting filiming that kind of an episode especially when the season will soon come to an end. Alex look good here it looks he did put some pounds, his face look fuller than the last episode we all watched from him. I do have some oither little spoilers from that particular episode. If you want to know what they are just let me know and I share the information. Looks tired butgood – probably very long hours on set! Can hardly wait to see this episode. If Alex thinks its epic – it must be!! Thanks for all the pix and info you post Tiffany – is much appreciated. I agree, Tiffany; Alex does look tired. But it probably was a grueling shoot. He still needs to put on a bit more weight. I’m sure all of us will volunteer to cook for him! Thanks for the photo and the tweet.